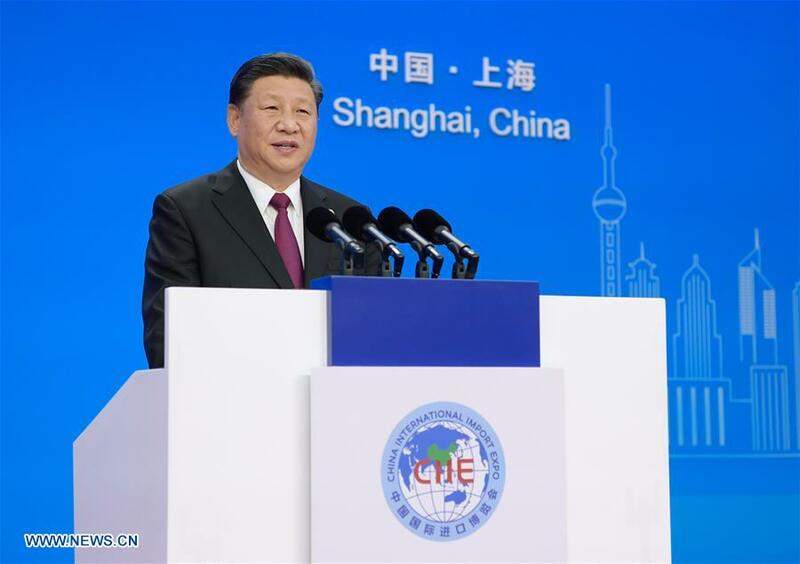 SHANGHAI, Nov. 6 (Xinhua) -- The keynote speech delivered by Chinese President Xi Jinping at the opening ceremony of the China International Import Expo (CIIE) signaled that China will continue to vigorously open up and cooperate with countries across the world, said officials and experts. During his speech, Xi underscored the role of economic globalization, saying that it is "an irreversible trend of history" and provides strong momentum for world economic development. "Countries need to pursue an open policy, explicitly oppose protectionism and unilateralism," Xi said, calling for joint efforts to build a more open global economy. Xi's speech is very much welcomed because "what we need today is not more borders but less borders," said WTO Director-General Roberto Azevedo, adding that "we need countries to leverage their potential to help each other and to give more opportunities to businesses and for growth." Australian Minister for Trade, Tourism and Investment Simon Birmingham in a statement welcomed Xi's strong commitment to China's ongoing reform and opening up and his remarks on the need to preserve and strengthen the rules-based multilateral trading system. Xi's speech was an opportunity to clarify the country's position on a few global economic issues, said Mahmoud Raya, director of the "China in Arab Eyes" news website. Raya said the speech is an invitation no one can reject except those who wish to protect their own selfish interests. Britain's International Trade Secretary Liam Fox said that it is "fantastic" to hear more from President Xi on China further opening up its markets to imports and investment, adding that the British government is "delighted to be supporting the event." Peruvian Foreign Trade and Tourism Minister Rogers Valencia said Xi's speech is a piece of good news to the world, especially at a time when waves of protectionism and unilateralism are threatening global growth. The minister added that China is not only a big exporter of goods, but is also transforming to an even bigger buyer. The Chinese president's remarks show that China honors its international commitments and wants all countries to have peaceful trade relations, said Souleymane Diarrassouba, commerce minister of Cote d'Ivoire. "The expo will help the globalization process to go on," said Chalom Schirman, associate professor and head of the international MBA program at the University of Haifa in Israel. China's effort to open up its market is undoubtedly heading in the right direction, he said.